Yellowstone is one of the most unique National Parks in the United States - and one of the most popular among visitors as well. This gigantic park spans three different states: Wyoming, Idaho, and Montana. The easiest way to get to the park is via a 5-hour drive from Salt Lake City, Utah. This is the second time I visited Yellowstone and I have grown to really appreciate the beauty of the park much more than the first time around. You can click on each photo to view in more detail. Enjoy! 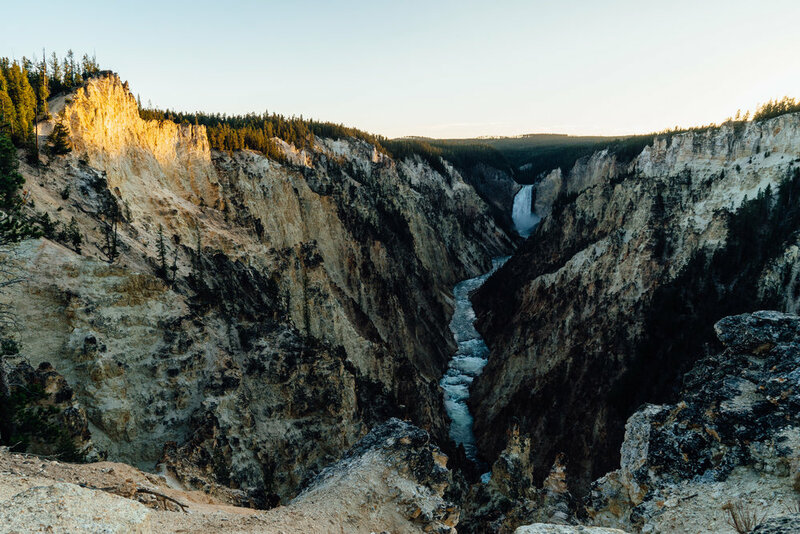 From lush alpine forests to steep canyons, Yellowstone features feels like many different parks in one. The park itself is quite large with the main road forming a giant figure 8. You’d most likely need at least two days to visit all the main attractions of the park. Lush green pine trees surrounding the Upper Fall give similar feeling to many national parks in the Pacific North West. Lamar Valley - Wide, open sub-alpine valley are home to many wildlife. Yellowstone River cuts through the Grand Canyon of the Yellowstone. Evening sun casts a beautiful golden yellow color on the canyon around the Lower Fall area. The most unique feature of Yellowstone is the many hot springs scattering throughout the park. The smell of sulfur is a giveaway that there are hot springs near by. 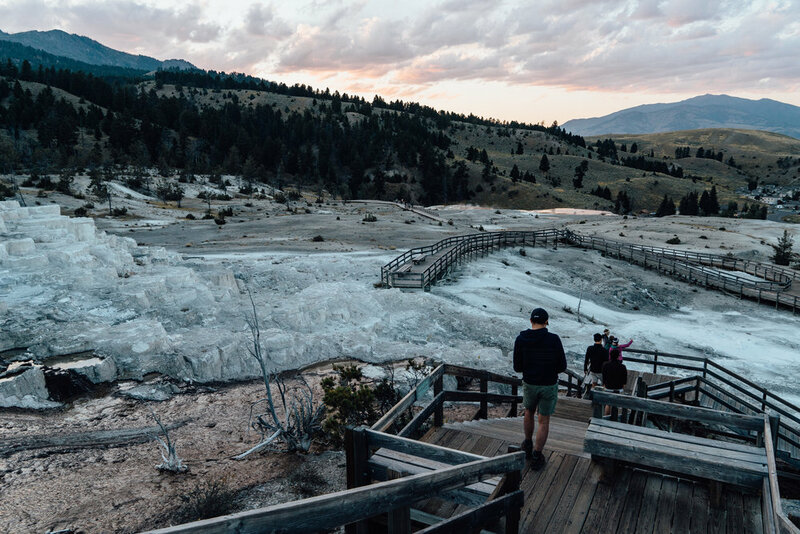 Upper Geyser Basin is home to some of the most impressive geysers in Yellowstone, the most famous being the Old Faithful Geyser. Picture here is the Beehive Geyser. 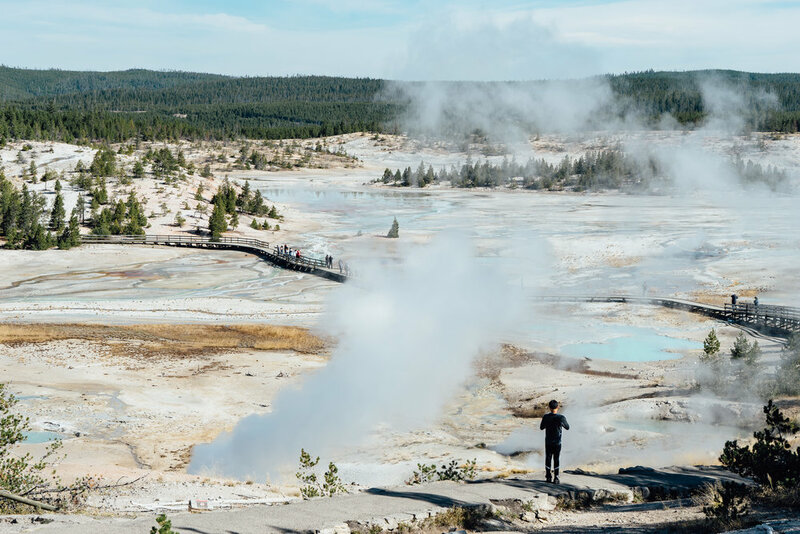 Norris Geyser Basin is the hottest and oldest of Yellowstone’s thermal area. The Grand Prismatic Spring is the largest hot spring in the United States. The spring got its name from the rainbow-like coloration. This photo is taken from an overlook which is an easy 15 minute hike from the parking lot. Mammoth Hot Springs situated along the hillside near the park’s North Entrance. The area contains a few dozen thermal features each with unique colors and patterns. The wooden walkway are very accessible - great for an evening stroll before a nice dinner at the nearby hotel. Wildlife watching is a popular activity among visitors of the park. 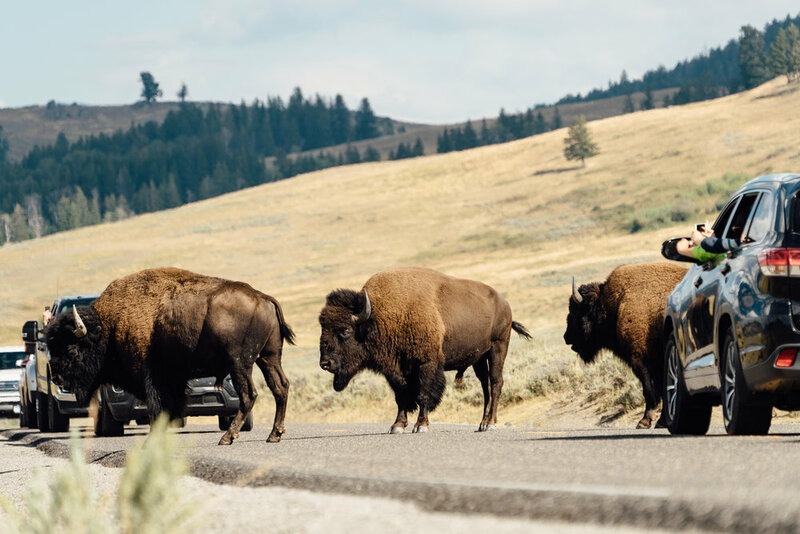 The expansive Lamar Valley and Hayden Valley are great locations for spotting wildlife like bisons and deer. You might even able to spot wolves and bears if you are lucky. The first animal that we saw in the park - a deer. First bison spotted! We got very excited. Little that we know we’d be seeing them everywhere. A peaceful looking bison taking an afternoon nap. Even though the bisons might look calm and somewhat clumsy, they can run as fast as 35 mph! Taking their time crossing the road, they don’t look to be bothered by the attention at all. A super-close up! This guy was literally posting for the photo next to the road. This is the pronghorn - the fastest land animal in North America! We didn’t realized what it actually is until we got back home. According to the internet, it is a pretty rare sighting. Osprays feeding their youngs. A photographer nearby showed us a photo of one of them with fish in its claw! Lone bison against a lovely sunset backdrop. A good trick for wildlife spotting is to follow the crowd. Here, we saw a group of people looking across the riverbank at two Grizzlies feeding on a dead Bison. Unfortunately, my lens was not long enough to get the bears but you can see one of them on this tour guide’s the iPhone screen. I found Yellowstone to be one of the most accessible national parks that I have ever been too. Trails are well-maintained and food is readily available at many visitors centers and lodges scattering around the park. Don’t forget to carry a bear spray if you are planning to go off into the back country. There are trails for hikers of all skill level. Most of the popular attractions are easily accessible through a well-paved trail. The view becomes more and more beautiful as you go off the main trail into the back country. A group of horseback riders ride through the valley. This visit to Yellowstone was a perfect ending to the summer. It is one of my top 3 favorite National Park. Next, I’ll be sharing some photos from Grand Teton National Park, which is just south from Yellowstone.